The bones of a giant are discovered. This turns Jack Robinson's life upside down as he learns the truth behind the fairy tale and how he can fix his greedy ancestor's mistakes. Q: Why is there a female Argonaut? Q: How accurate is this? This TV mini series was on over the Easter Holidays and i was caught by the impressive cast that they had lined up for this movie.... i also had to watch it also because i really enjoy greek mythology. What i got was over 3 hours of false mythology that doesn't even deserve to share the same title as the 1960's original. 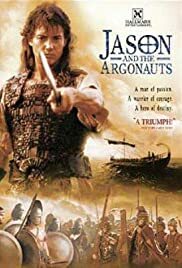 Jason London was not convincing as the main character Jason, neither was Dennis Hopper unfortunately who fell victim to a silly scene at the end where hes wearing the fleece on his head, it cracked me up, he looked an idiot. Natasha Henstridge and Derek Jakobi were not in it enough to make any sort of impression and the gods were too merciful i thought. The SFX was okay, but i still prefer the ground breaking effects of Ray Harryhausen who's designs for the titans in the original scared me when i was younger. This film was false when it comes to sticking by the facts of greek mythology i.e. there were no female argonauts - Atlantas is a false. Also the fact that Orpheus was greek and not African, these are just a few points from many mistakes that effected this series. My two biggest groans though must be.... a) Why did they replace Talos the bronze giant with that stupid bull, Talos was my favourite Titan in the original and i was looking forward to see him redesigned for this series.......but not into a stupid bull that breathes fire....OH DEAR! Also the Hydra was replaced by a dragon......why?......i don't know? and b) The sound effects were not as ground breaking as the original. The sound for the original film captured half the scene, an example being the appearance of Talos - it created tension. It was sorely missed.